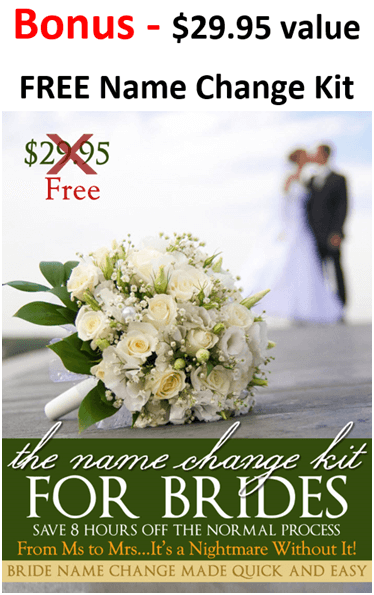 Receive this Name Change Kit as a free bonus – if you order within the next 3 minutes! 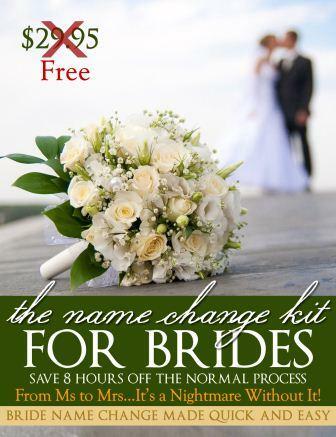 Order the Premarital Course within 3 minutes and receive thisName Change Kit ($29.95) as a free bonus! 1. Pay $19.95 for Course downloads to your browser. 3. Take your Certificate of Completion to the courthouse to wave the 3 day waiting period and recieve your $25.00 discount. To waive the 3-day waiting period and receive your $25.00 marriage license discount it is necessary that you take your premarital counseling from a registered premarital provider. Not all premarital course providers are accepted in every county but don’t worry we are approved within every county. 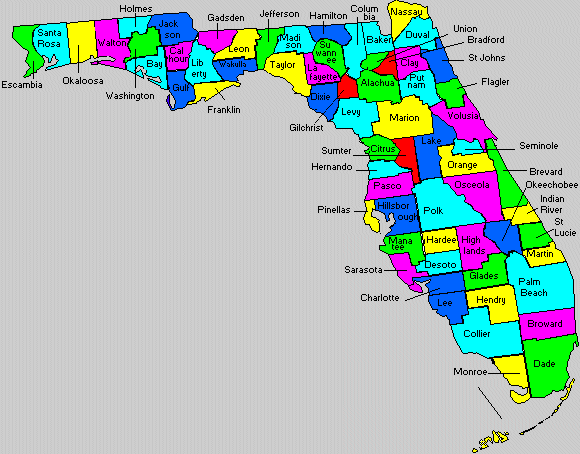 Providers in all 67 counties in the state of Florida. Check credentials by this link. How long will it take for me to get my Certificate of Completion? You will receive your Certificate of Completion instantly after submitting your verification form. No need to wait – 24 hours a day delivery. Print out the certificate and then take it with you to the courthouse to waive the 3-day waiting period. Florida statutes mandate that you spend at least 4 hours of marriage preparation to qualify for your Certificate of Completion. You are required to receive education on: finances, communication, conflict resolution and parenting. Do we both have to pay for the premarital preparation course? No, the payment covers the both of you. Also, if you are Florida residents you will receive a $25.00 discount off the cost of the marriage license. 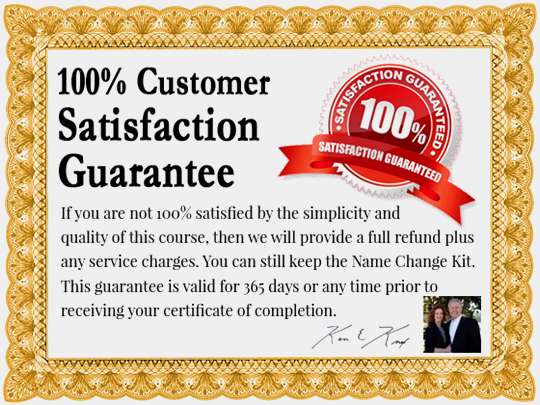 How long will the Certificate of Completion be valid? It is good for one year from the date it is issued. 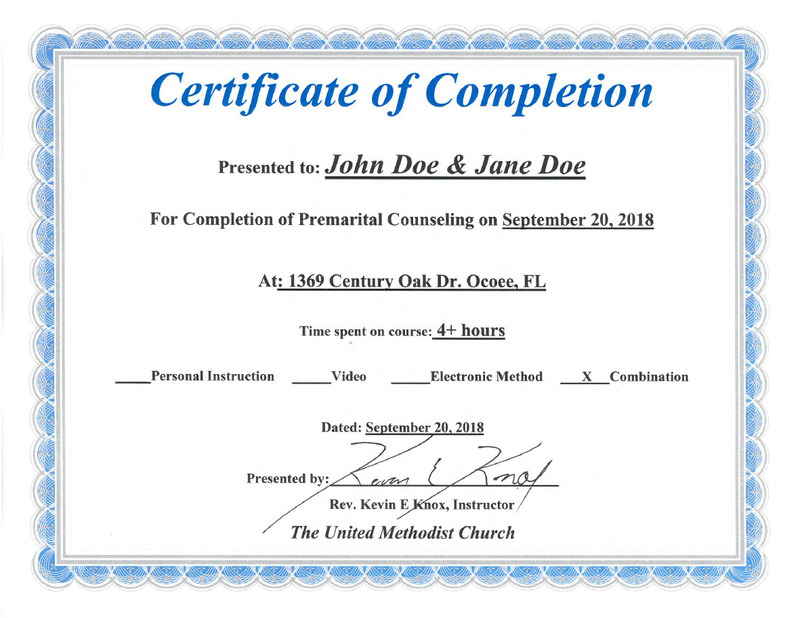 Is your online premarital course accepted in Florida? 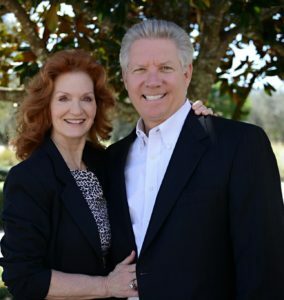 Yes, we are recognized as registered premarital course providers in all 67 counties in the state of Florida. On this same web page, you can check the PDF copies of our “course provider” forms to verify that we are registered with your county. How do we pay for the online premarital course? We presently use PayPal to process all payments. PayPal also accepts credit cards so it is not necessary for you to have a PayPal account to use the system. Can I take the pre-marital course over a time span of days, weeks or months? Yes, once you receive the marriage preparation course you should save it to your computer. This way, you can refer to it repeatedly as your time schedule allows. How does my partner and I take the premarital preparation course if we are in a long-distance relationship? After making payment for the pre-marital course you should save it to computer. Then, you can send it to your partner. Any discussion that’s required for the marriage preparation course can be done via Skype or phone. My passion for marriage preparation grew from the aftermath of my divorce in 2001. It was then I made a vow that I was going to find out what made marriages work and what made them fail. After 14 years of researching pre-marital preparation professionals, marriage experts and relationship gurus I ended up with a proven collection the best practices and principles. What I learned not only made a huge difference with my 2nd marriage but it has also helped thousands of other couples. This online version of the Florida premarital course is an effort make the empowering content more convenient and assessable. It’s my hope and prayer this pre-marital course would transform you and your marriage. Rev. Kevin is a member of the National Association for Relationship and Marriage Education and an alumnus of Smartmarriages conferences.